A 2014 F-150 on display this week at Uftring Ford in East Peoria, Ill. Ford's retail sales of the F-150 rose 7 percent, and the 2015 version accounted for 21 percent of those deliveries in February. DETROIT -- Ford Motor Co. posted its eighth U.S. sales decline in the past 14 months, allowing Toyota Motor Sales to overtake it for the first time in six months. But the automaker said today retail sales of the F-150 rose 7 percent and that average transaction prices for the pickup rose $2,000 from a year ago. Across its lineup, Ford said retail sales were flat last month from February 2014, while fleet deliveries fell 5 percent. Its total light-vehicle sales were down 2 percent to 179,673 units. That compares to 180,467 for Toyota Motor Sales U.S.A., a 13 percent increase. 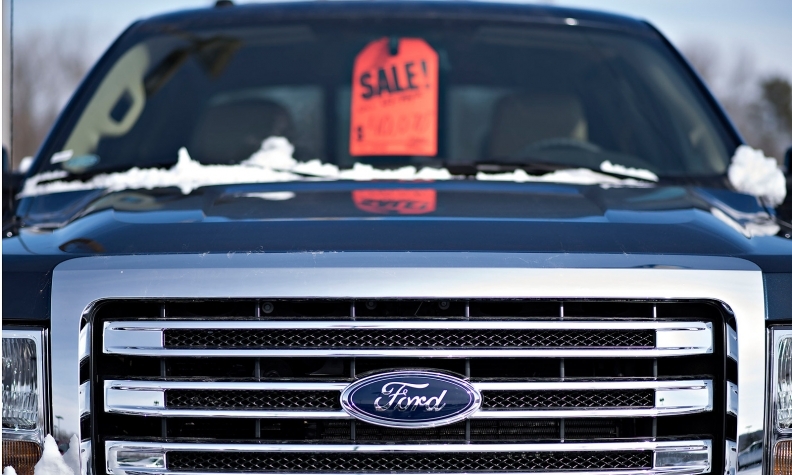 So far this year, Ford sales are up 6 percent. Ford said its performance remains hampered by tight inventories of the aluminum-bodied 2015 F-150, which began shipping to dealers in November. It posted an 8.1 percent decline in sales of its car models and a 9.6 percent drop in sales of the Escape crossover. Bright spots were the Explorer and Mustang, with both nameplates increasing 32 percent. The Escape, the nation’s second best-selling utility vehicle last year, dropped to fifth place in February, behind the Honda CR-V, Toyota RAV4, Chevrolet Equinox and Nissan Rogue. LaNeve said the Escape’s decline was largely due to a planned cutback in fleet deliveries. A 41 percent drop for the larger Edge crossover “wasn’t unexpected in the least,” he said, as the redesigned 2015 Edge makes its way to dealers. The Lincoln brand posted a 7.5 percent decline. Sales plunged 40 percent for the Lincoln MKZ and 44 percent for the MKX, which is being redesigned later this year. Sales of F-series pickups declined 1.2 percent, as the company ramps up production at the second of its two F-150 plants. Retail sales of the F-150 rose 7 percent, and the 2015 version accounted for 21 percent of those deliveries. Ford’s chief sales analyst, Erich Merkle, said sales of the 2015 F-150 have had a “really rich mix,” as buyers clamor for Platinum, King Ranch and other high-end trim levels. In addition, incentive spending on the redesigned F-150 is “down significantly, as you’d expect,” Merkle said. LaNeve said the selldown of the 2014 F-150 and rollout of the new version is right on schedule.